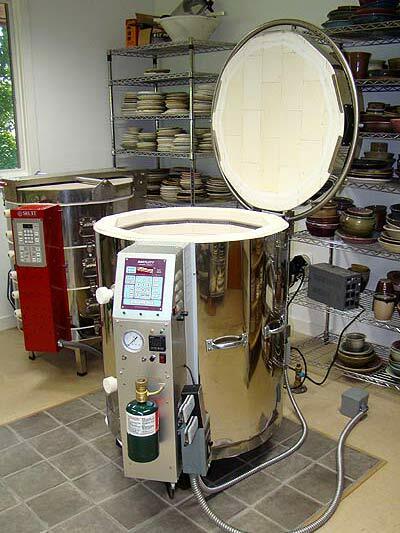 It controls the amount of reduction with an oxygen sensor based feedback loop wired directly into, and controlled by, the kilns temperature programmer / controller. just makes $$ sense for the potter. 3. Bisque in an oxidizing atmosphere. 4. Bisque in a reduction atmosphere. 5. Glaze fire in an oxidizing atmosphere. 6. Glaze fire in a reduction atmosphere. as most electric kilns do. programs for duplicating firing results. on any computer hobby kiln. system, just plug it in. Dr. Arnie Benton was an amateur potter when his Fallonator®-JMH7 HL arrived in 2009. He is a Crystalline Artist, so you know he is supper tough on his Kiln. After two years of reduction firing, and all those cone 10 and above crystalline firings, and still with the same elements it came with. Not everyone will have the same results as Dr. Arnie firing their JMH kiln. However Dr. Arnie submitted 3 pieces to be juried for the 2011 NCECA conference in Tampa Florida, and all three where accepted. before the gas kiln ships.